Panning for Gold MS miner panning in creek while smoking a pipe, he sifts water & sediment through traditional gold pan. Weighing Gold MCU of man in historical costume pouring gold from leather bag onto dish of balance scale. CU gold nuggets being poured from leather bag onto the dish of the balance scale. MCU hands of dry goods merchant and miner as the former evens up the measure and gives the miner back his sack, the miner then picks up his newly purchased mining tools and exits. MCU a different style of balance scale as weight is added to one side. Similar or identical shots of merchant weighting gold in trade for purchase of mining equipment. Weighing Gold MCU scales and mining tools on counter at old time assay office. MCU man pouring gold from leather bag onto balance scale until the gold tips the scale. CU substantial amount of good sized gold nuggets pouring from leather pouch onto balance scale plate. Image quality is not the best. 25 years ago (1934). A gold rush in Mojave, California has fortune seekers pouring in, recalling the fabulous boom of '49. Male Caucasian miners. Man's hands holding what might be gold. News in Brief: Gold Rush In Georgia. News in Brief: Gold Rush In Georgia. Week-end gold seekers have fun and profit out of panning for gold in Georgia streams. Hundreds turn out to search for the bright nuggets, and many find that fun really pans out. Some of this could pass for family vacation, certainly recreation. Teen girl and younger brother are among those wading and looking for gold. Some very brief but good shots of a gold miner (prospector) standing in rock creek bed working a sluice of some sort, mining. MCUs of muddy river, rocks protruding surface; the hand of a white man dressed as a Gold Rush era gold prospector plucks a nugget of gold from the river. Yesteryears Automobiles. Shot of early automobile. CU of 1911 Ford and license plate Oregon A-157. Man polishes hood of old car, CU of a car's manufacturer name. Man waves hat at camera while sitting in an old automobile. CU shot of a car's front. Man, wearing trenchcoat, cap and googles, hand cranks his car. Hood is removed and engine is shown. Another old auto is backing up. CU of car's grille with a symbol on it. Shot of person changing gears. People put a sign mentioning something about Geneviere on the back of their car. Their license plate is A-106. People hold up a sign in the car window saying, "We're on Our Way to See Geneviere." Old cars procede down a town street. Shot of movie theater exterior with old cars parked out front. Marquee says something about the British Film: Geneviere. People walk into the theater. Shaky light in contrast and imagery New Gold Rush - Miners working mine. Man holding raw gold in his hands. MCUS of a miner with a smile. Two miners digging. Another MCU of a miner smiling. A MS of the tents and shacks they live in as they work the mine. Available in HD (16x9) and Standard Definition (4x3) TLS people milling about the historic downtown main street of Skagway, Alaska. 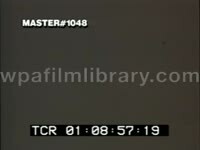 This clip is available in HD. This clip will require additional time and pricing. MCU wooden trough used by early gold miners to sift through soil and rocks from creek bed, a shovel is used to move debris through, a hand reaches down to throw a rock out. 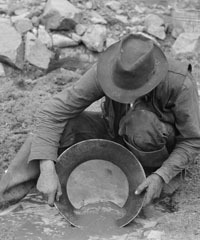 MCU forty-niner panning for gold, slowly swirling water around in traditional gold pan, he picks out a rock or two and throws them away. Low angle MCU old male miner in miss-matched flannel leading his donkey (burro, mule) past camera. CU gold collecting in miner's pan as water is swirled. MS miner squatting in creek with his gold pan. CU mining pan with silt in bottom, hands carefully dip it into water and wash / filter the sediment. CU hands agitating pan filled with creek sediment. CU sediment in pan. CU small amount of gold collected in pan, an old-fashioned knife is used to push the gold chunks around. MCU miner scooping creek sediment into gold pan, hands swirl the pan removing water and sand. CU clear creek water, a miner's boot steps into frame, miner's hand reaches down and picks up a gold nugget substantial in size. Several CU/ECUs of dirty fingers picking up a large gold nugget out of creek bed. MCU miner swirling gold pan. Gold Miners Low angle MS looking up at older, overweight miner leading two burros over hill. LS/MS two miners walking along cliff wall with their burros, one with a rifle slung over his shoulder. MS as miner sets his riffle down on flinty rock. MS miners retrieving tools (pickaxe, shovel, gold pan) from burro satchel. MS/GV miners chipping away and sifting through flint rock. MCUs of burro heads as they wait patiently.